Ducks, yes that’s right little itty bitty ducklings at Camelot Hills. I know it’s a Baa-log but hey, we are still a farm. So a close friend of ours over at J & J Acres had some Muscovy Ducks (some call them Scoobies) for sale and we just had to buy a few, five to be exact. We have never raised ducks before, we’ve had chickens for many years, but never ducks. Why ducks now? Well, why do we do anything on a farm? In our case, these ducklings will grow into pets and possibly producers for the eggs and possible sale in the future thus providing our farm with a little more income to pay for the things any farm needs…more goats, and feed and hay and more goats! Why Muskovies? Well it’s what Jared and Jennifer had and we’ve heard great things about them. They eat loads of bugs like flies and mosquitoes…something we have plenty of in Mississippi. They are also ‘quiet’ ducks. So they shouldn’t make too much noise. They also are claimed to “stay home” rather than fly away. As we have ducklings, these things will just have to be proven to us over time but I trust they will be true to their reputation. Did I mention I know a LOT about chickens? 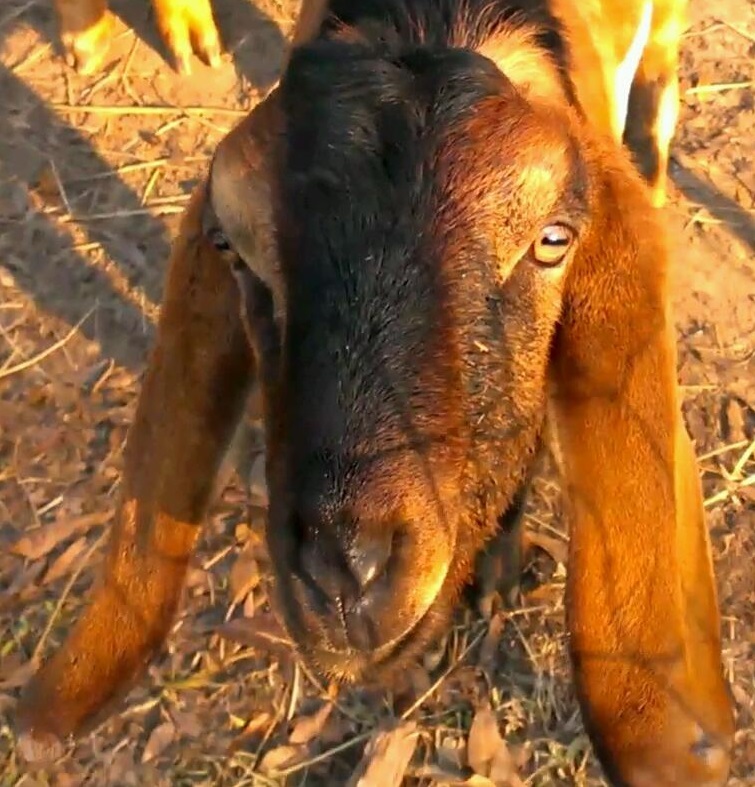 Well some used to call me the chicken man…now I’m working on the title Goat Whisperer. How hard could raising ducks be? They are still poultry right? Yep. But they behave quite differently than young chicks. To be honest, so far they haven’t been any more trouble than chicks but they do have some very interesting differences. For instance, when we take chicks from their brooder to clean it, chicks would usually go in all different directions exploring. The ducklings however tend to stay very close together and follow one particular lead duck around. You would never see a young chick doing this unless the lead chick had food. The ducklings seem to always be together and quite frequently they are all “in a row”. Sometimes a side by side row, other times a one behind the other row. Today we gave them a little mini pond in their brooder and they just went nuts…it’s was like when you give goats something new to climb on…they just were all about it. Splashing and playing. We can’t wait to get them into their new outdoor enclosure so they have more room to run and splash. They are a welcome addition to our farm and we are looking forward to haven them around to help us keep an eye on things. And maybe, just maybe they’ll make some goat friends while they are here. 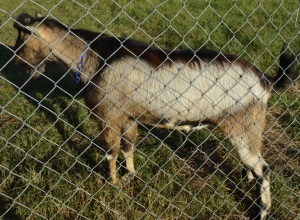 We’ll keep you updated on how they are doing and anything new we learn with them just as we try to do with the goats. Until next time, may your udders be full and your kids and ducklings plenty. Disclaimer: this was written a couple months ago and I’m just getting it uploaded. The ducks are now full grown and doing well. We’ll right a new blog on them later. Thanks for reading! All Does are Bred and this fella pictured to the left ain’t none to happy! Well, all the ones we intend to breed at least. Lady (She’s A Lady) wasn’t bred as we thought it was best to hold her over until next season as she’s a bit small, however she’s starting to catch up with the others and is turning out to be one fine doe! She’ll do well in the juniors I’m sure. Seems everyone took so we should be having a busy kidding season in spring 2015. So here’s a quick rundown of who’s bred to whom. In the Alpines, we have Marlena and Monica who were bred with Barnibus from Sweet Chariot Farms. 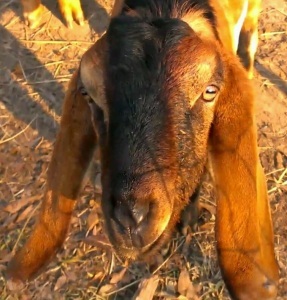 Then we have Queen (I’m a Beauty Queen) with whom we bred with our own Nubian Merlin. Her kids will be ADGA registered as Recorded Grade. In the Nubians, we have Misty (Ain’t I Something Mister) bred to Merlin. Then we have Melody (Misty’s daughter) bred to Arthur. I can’t wait to see which one of these two bucks produce the better kids. To my novice eye Merlin is the better buck but they are twins! It is Merlin and Arthur’s first breeding season as well. So we’re really excited to see what they all produce. All the expected kids will/can be registered with ADGA. It’s like waiting for Christmas! At the 2014 Mississippi State Fair, Soraco Farms I’m A Beauty Queen took Champion in her class and then took Junior Doe Reserve Best in Show for the 4H show! We couldn’t be more proud. Her first showing. Queen was only 7 months old at the time. Her owner Jessica (pictured) was just over the moon happy. 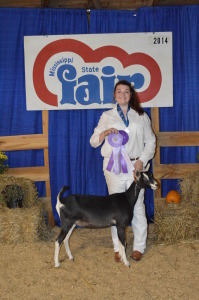 She had some really great competition and as crazy as this little doe is did surprisingly well in the ring.